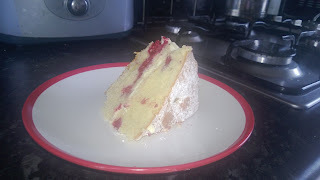 Yesterday, if you read my blog, was of course World Baking Day and I have to tell you that after blogging (and confessing), about my obsession with glass cylindrical storage containers, I did get around to some serious and enjoyable baking to live up to the spirit of the day. What made the day even more of an occasion, after buying “John Whaite Bakes” (winner of “The Great British Bakeoff” 2012), book just last weekend, I decided to pick out a recipe to try out. I wish I could confess to having picked exacly which recipe on the spare of the moment on the day, but since buying and flicking through the pages, I’d already had this recipe picked out for at least five days in advanced and had sought out the ingredients when completing my weekly grocery shop. First up for World Baking Day and the first recipe from my new inspiration was a raspberry sponge cake with a white chocolate ganache. The amateur baker I am, I’ve never really created my own ganache before, so was a bit apprehensive about what I was doing with this creamy chocolatey centre for my cake, but always ready to try out something new and learn. I have to admit that I thought I knew exactly what I was doing, only to find that I couldn’t get my ganache to thicken quite as much as I’d hoped. Chocolate can be a tricky thing and having seen chocolatier Paul Young at the Durham Food Festival last year, there is a lot more skill than first meets the eye. Fortunately, the Internet is a wonderful place to find answers and a quick search instantly revealed what I was doing wrong; not enough whipping! My first instinct of wanting to simply add more chocolate being completely wrong, but a quick whizz of the mixture in my Magimix soon thickened up the ganache ready for the cake. After having tasted the cake, my initial first bite without the ganache, I thought the bitterness of the raspberries was ultimately going to disappoint my whole baking adventure, but on the second bite, this time with the white chocolate ganache, the bitterness was instantly taken away with the smooth and silky white chocolate taste. A perfectly balanced taste and now a firm favourite recipe that I’m sure to repeat again and again. The John Whaite book is full of great ideas and I can thoroughtly recommend that you seek it out and give some of them a try – I doubt you’ll be disappointed.